Scientists have a secret weapon in their war against wasps – other wasps. German and common wasp problems cost New Zealand’s primary industries around $130 million a year, but a parasitic wasp whose larvae feeds off their host before killing it is expected to change that. It’s an idea that has been used with some success since the 1980s, but scientists have discovered the wasps they’ve used in the past might speak the wrong language. “In order for the Sphecophaga to go undetected in the nest, they may speak the correct language, or dialect, in order to fool their hosts,” Landcare Research biocontrol scientist Ronny Groenteman said. . . Despite the organic sector’s rapid growth kiwifruit growers might need to do even more to maintain the advantages they have in the marketplace, food marketing expert Professor David Hughes warns. Hughes, from Imperial College, London, gave growers his take on developments in the booming organic sector that is now topping US$80 billion a year in global sales. He spoke at Zespri’s inaugural organic dinner, hosted by the marketer to showcase organic produce and give the industry’s small pool of 80 organic growers insight to global developments. . .
With low groundwater levels confirmed by Environment Canterbury today and the outlook for recharge before the coming irrigation season not looking good, irrigating farmers must ensure their equipment and irrigation schedules are up to scratch if they are to survive another dry summer, says IrrigationNZ. “Preparedness for the coming irrigation season is vital. Poorly operating irrigation systems cost time and water efficiency, not to mention the additional cost to production. Farmers must make sure irrigation systems are operating as efficiently as possible because water resources are already stretched so every drop must be optimised,” says IrrigationNZ Project Manager Steven Breneger. . .
Alastair Bisley has stood down as the Land and Water Forum’s Chair after seven years in the role. Soon after the Forum was establishment in late 2008, Alastair was appointed its Chairman to moderate a multi-stakeholder consensus on the challenging issue of freshwater policy reform. The Forum’s recommendations have formed the basis for decisions by Government and regional councils that are progressively deploying its recommendations. . .
(BusinessDesk) – New Zealand commodity prices rose for a third straight month in July, led by dairy products, aluminium and meat, although the strong kiwi dollar limited the benefits for local producers. The ANZ commodity price index rose 2 percent last month, bringing its three-month gain to 6.9 percent. In New Zealand dollar terms, prices have gained just 2.5 percent in the past three months and are 5.7 percent lower than in the same period last year. . . .
Nelson company DroneMate is launching a ground-breaking new agricultural farming drone into the New Zealand market that features a multi-application sensor developed by US company Sentera. Marketed as DroneMate Agriculture, the product costs $5000 (approximately one third of the drone technology currently being used for much agricultural survey work) or $7000 for the deluxe model and is poised to revolutionise the way that aerial survey technology is used by farmers across a range of sectors, including dairy, horticulture, orcharding and viticulture. . .
Māori landowners and honey producers will be buzzing in Rotorua over the next two days (4/5 August) as they attend the He kai kei aku ringa National Māori Mānuka Hui. Associate Minister for Economic Development Te Ururoa Flavell, who is opening the hui this morning, says there are major opportunities for Māori landowners in mānuka honey because of rising demand and prices. “New Zealand exports more than $220 million of honey a year and volumes have more than doubled in the last 10 years in response to rising prices. . . The New Zealand Young Horticulturist of the Year 2016 competition — traditionally dominated by the regions — has taken a surprising twist this year with the Auckland and Wellington regions making a clean sweep of early results. • 2016 New Zealand Amenity Horticulturalist competition winner: Jeanette Barker, Auckland Botanic Gardens. • 2016 Young Grower of the Year, Andrew Hutchinson, AS Wilcox, Pukekohe. • 2016 Nursery and Garden Industry New Zealand Young Achiever Award, Daniel Howard, Moores Valley Nurseries, Wellington . .
A new report released by the Ministry for Primary Industries indicates a lot more people in the sector are going to have to have a tertiary qualification if they hope to take advantage of a predicted 15 percent increase in jobs by 2025. MPI manager of science and skills policy Naomi Parker said even roles that traditionally did not require post secondary school qualifications would do so in future because of the increasing reliance on technology. . . . The objective of the national pest management plan is to eradicate the disease from at least 2.5 million hectares of the country’s total TB risk area by 2026. TBfree New Zealand aims to eradicate the disease from the Rangitoto Range as part of this plan. . . .
Framing new ways for organisations to collaborate over controversial decisions, such as water use, is the focus of a Massey University symposium involving some of New Zealand’s key leaders in governance. The July 8 symposium, Redefining Governance for the new New Zealand, brings together a diverse range of experts and thought leaders with experience in governance. orum), Suzanne Snivelly (economic strategist), David Shand (public sector reformer and a member of the Royal Commission on Auckland Governance), Grant Taylor (Auckland Council’s governance director), and Dave Hansford (award-winning photographer and environmental journalist). . . .
Fonterra Co-operative Group Limited announced today the appointment of Robert Spurway to the role of Managing Director Global Operations, a newly-created position on Fonterra’s management team. Chief Executive Theo Spierings said Mr Spurway was uniquely qualified for the position. “Robert is currently Acting Director New Zealand Operations in NZ Milk Products, responsible for overseeing milk collection, manufacturing and logistics for the Co-operative’s New Zealand milk supply. “One of our top business priorities is to optimise our global ingredients sales and operations footprint, so we can better manage price volatility and increase value, while ensuring a total focus on food safety and quality, and our customers’ needs. . . Agricultural Fieldays 2014 will be a measure of how the agribusiness sector is gearing up to capitalise on growing export opportunities, according to New Zealand’s largest agricultural lender, ANZ New Zealand. “With an economic recovery in full swing and growing export demand for New Zealand agricultural products, the scene is set for farmers to again invest in the technology that will drive productivity,” said Graham Turley, ANZ’s Managing Director Commercial & Agri. “Agri-business is New Zealand’s most productive and successful business sector and it achieves this through ongoing investment in market leading technology. Agri businesses are only as successful as they are because they constantly innovate. . .
Technology designed to bring the power of intelligent communication and unprecedented future proofing to dairy farmers’ milking systems will be highlighted at National Fieldays. The product in the spotlight at this year’s show (11-14 June) on the Waikato Milking Systems stand is a newly designed product known as the Bail Marshal. The New Zealand owned company’s Chief Executive Dean Bell says the innovative product has been designed to enable all technology devices on a milking system to work together seamlessly and continually communicate with each other. . . .
Our national butchery team diced up their final practice yesterday proving they have got what it takes to defend their title against Australia and England next month. 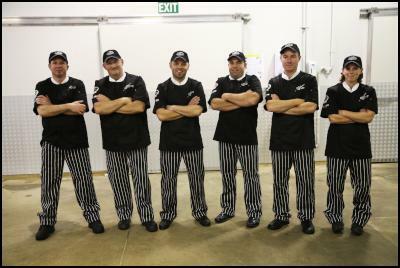 This year our team of six top butchers, the Pure South Sharp Blacks, travel to Yorkshire, England to compete in the Tri-Nations Butchers’ Challenge. After many months of refining their skill, the Pure South Sharp Blacks performance at their last practice, held at Wilson Hellaby in Auckland, has confirmed just how promising our national team is. . . The Alto Young Butcher and Competenz Butcher Apprentice of the Year is well underway with the Lower North Island Regional held yesterday in Palmerston North. The Alto Young Butcher winner Alex Harper of The Village Butcher in Frimley, Hastings and Competenz Butcher Apprentice winner Amy Jones of New World Taumarunui have successfully secured their place to challenge some of the finest butchery talent in the country at the Grand Final in September. Alex and Amy’s motivations are high with a study tour around Europe up for grabs if they are successful in the next stage of the competition. . . .
New Zealand Trade and Enterprise has been giving the world a taste of New Zealand. In Dubai, New Zealand was centre stage for the 2014 Taste New Zealand chef competition. Targeted at professional chefs, the competition aims to raise awareness of the diversity and quality of New Zealand food and drink products available in the United Arab Emirates amongst chefs, buyers, and food service and retail industry leaders. Last year, the competition helped NZTE customers secure $4 million in new deals. . . .
New Zealand has plenty of water but not all of it’s in the right place at the right time; and not all of it is as clean as it should be. The need for better management of water is clear, the best way to do it is somewhat less so, but the Land and Water Forum’s report, A Fresh Start for Water, is a good place to start. It was welcomed by Agriculture Minister David Carter and Environment Minister Nick Smith. “The Land and Water Forum has achieved a first in New Zealand – consensus on a way forward for managing freshwater,” Dr Smith said. “The Government initiated this collaborative process because the long term success of future water policies relies on broad agreement at a national level. Improving water management is one of the Government’s top environmental and economic priorities. Finding durable solutions to issues of water quality, allocation and storage are essential to a healthy environment and our long-term economic progress. Getting 58 groups with a diverse range of views to collaborate let alone reach agreement on a report is amazing. It is in all our interests to maintain and improve the quality of freshwater in New Zealand, including instream values. For that we need limits, standards and targets in line with national needs, values and objectives which are applied taking account of the needs, values and objectives of communities. They must address contaminants and flows. Setting limits will require us to address degradation in some areas, but will enable more resource use in others. Limits need to be clear enough to achieve certainty, but able to be adapted in the face of new information and new technology development. • Maintains regional councils’ control of the use of land for the purpose of the maintenance and enhancement of the quality of water in water bodies and the maintenance of the quantity of water in water bodies and coastal water. The report signals greater use of collaborative processes in water policy-making and implementation at national, local and catchment levels. “For farmers, this is actually great news because involving landowners in any process is essential where policy outcomes could directly affect their property and what they can do with their land. Given this, it’s only fair and right landowners take charge of implementing any changes that may result. “Real progress also starts with decision making and how communities are informed. Above all else, how the resourcefulness and innovative capacity of New Zealanders to develop local solutions will be tapped into. “On-farm, farmers have to look at stock and effluent management systems tailored to location, including fencing waterways where practical. Reducing our effluent disposal risks will lead to better nutrient utilisation and increased pasture growth. No-one is denying that some farm practices can, and do, degrade waterways. What is often overlooked is that rural people have a personal interest in the quality and quantity of fresh water because the rivers we neighbour provide water for our farms and our homes. “Yet some activists conveniently seem to look through the impact of New Zealand’s third most numerous large mammal, Homosapien. This is not a ‘them and us’ blame culture that has coloured perception, but a realisation that we all rely on the environment. Pollution from human and industrial waste is an issue which needs to be addressed too. “Collaboration is a useful process that can result in more enduring and widely accepted outcomes, while saving significant amounts of money and time. “Collaboration, like consultation however, does not equal agreement and there has not been agreement on all the issues identified in the report. Feds took part in the forum but hasn’t signed up to the report because it wants to consult farmers on the recommendations and get feedback first. The government is also waiting for feedback. The report is a good start but there’s a long way to go before it turns into concrete policy. Water New Zealand’s response is here. Forest & Bird’s response is here.